Guck, Inc was formed in 1994 by Lars Guck and has become the definitive high performance dinghy and catamaran repair and construction shop in the North East. 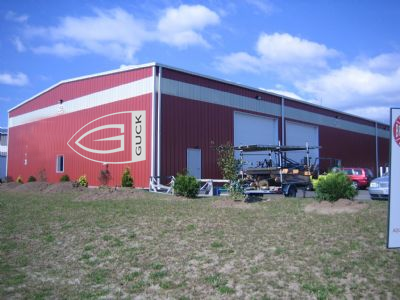 If you are looking for quality work performed by top level sailors who understand your concerns, then Guck, Inc. is your shop. Our combined racing experience at the top level worldwide means that you do not have to worry about the end result, and you do not have to wonder about who is actually working on your boat. We are not a fairing factory, we are a small shop that gives each project the same level of attention and care. We will make your boat as good as the boats that we bring out to the course! We have recently moved to a new, larger facility in Bristol, one that provides us with even greater capacities and capabilities. Our main work room is 40' x 70' accessed through a 16' x 14' door, so we can now work on boats of any size. This room allow us to set up and work on large trimarans, keelboats, even large power boats. Large scale Awlgrip jobs are now possible, and we continue to specialize in custom composite and epoxy fabrication. We are currently equipped to do all types of repairs, rigging and maintenance on boats up to approximately 40 feet long, including Farrier Trimarans, E22's, Rhodes 19's, and Solings. We are a Vanguard approved warrantee repair facility, specializing in gelcoat matched repairs that are invisible to even the trained eye. We have a custom built spray booth for gelcoating, Awlgrip painting, and heavy duty grinding. We constantly follow developments in the marine industry and use only the highest quality materials and parts. In addition we have a fully equipped woodworking shop, complete with built in dust collection, downdraft sanding stations, and all the necessary tools. With nearly 10 years of custom woodworking and cabinetmaking experience, we have the knowledge and tools to do your job right! In addition to the dinghy repair work we specialize in, we also fabricate boats and parts from scratch, including custom tooling manufacture. We worked with Steve Clark and Vanguard on the development of the Vector, and are currently developing a new A-Class Catamaran design that is being tested in Bristol and around the world.